New Extreme 40s set feathers flying following Moreton Bay Multihull Regatta. For the first time, three Extreme 40s are competing on the winter racing circuit, which commenced with the Moreton Bay Multihull Regatta, hosted by RQYS and Multihull Yacht Club Queensland, 4 to 7 April. All built around 2005, the seriously fast one-class competed in a stadium style series in Europe and was sailed by some of the biggest names in the business. 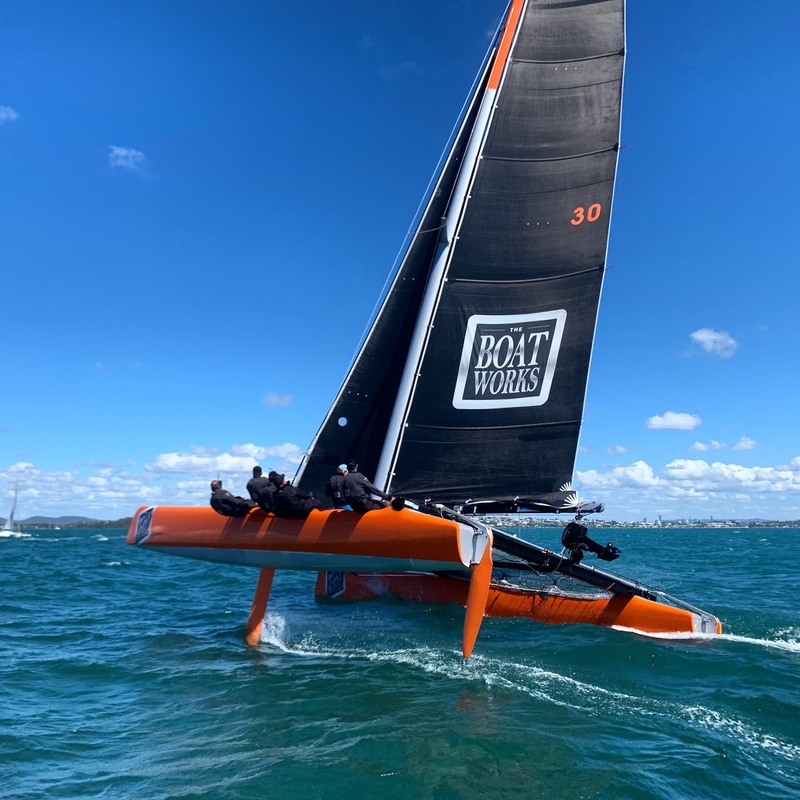 The local Extreme 40 fleet now comprises Tony Longhurst’s The Boat Works, Back in Black owned by Michel Van Der Zwaard, and Mike Peberdy’s High Voltage, with one more vessel on the way and due in time for the 2019 National Championship, 8 to 15 August, part of Airlie Beach Race Week. Quizzed about the AC/DC theme, Mike says “it was really about engaging with our nine-year old son, who likes AC/DC”. The Boat Works skipper, Julian Griffiths says they are heartened by the take-up of the Extreme 40, and hungry for the competition. As Julian explains, the appeal of the Extreme 40 is universal. “They are good value for money for what you get and the racing experience,” he said as a veteran of two seasons of sailing and several victories in major regattas, including winning the Moreton Bay Multihull Regatta two years running. “For crew, there’s the thrill of the closeness of racing. Being one design, they’re closely matched, and it’s very challenging. For spectators, it’s a sight to see highly competitive, fast multihulls at top speed, neck and neck. The fourth Extreme 40, the ex-Land Rover boat, is on its way and will also be based on the Gold Coast, owned by Alex Toomey and a syndicate, and scheduled to debut at Airlie Beach Race Week. Mike Peberdy, who describes himself as “more of an enthusiast than an expert”, competed on High Voltage on the weekend, which he admits was “a steep learning curve”. “We had a gear breakage on day 2, but Ben Kelly from Quantum sails sorted that out and we were back on day 3, when we really came into the mix and came third,” he said. The Moreton Bay Regatta, in its second year, was a great proving ground for High Voltage and its crew. “We were really happy and appreciate the tremendous amount of support and coordination from RQYS and the Multihull Yacht Club Queensland. Drawn to the Extreme 40 for the allure of high performance, Mike has a background in sailing skiffs. After a break of 15 or so years, he bought and refurbished a racing cat, XL2 which he entered in several regattas, including Hamilton Island Race Week. “There will be four Extreme 40s soon, which is going to be great, and many more others taking to racing multihulls,” says Mike. 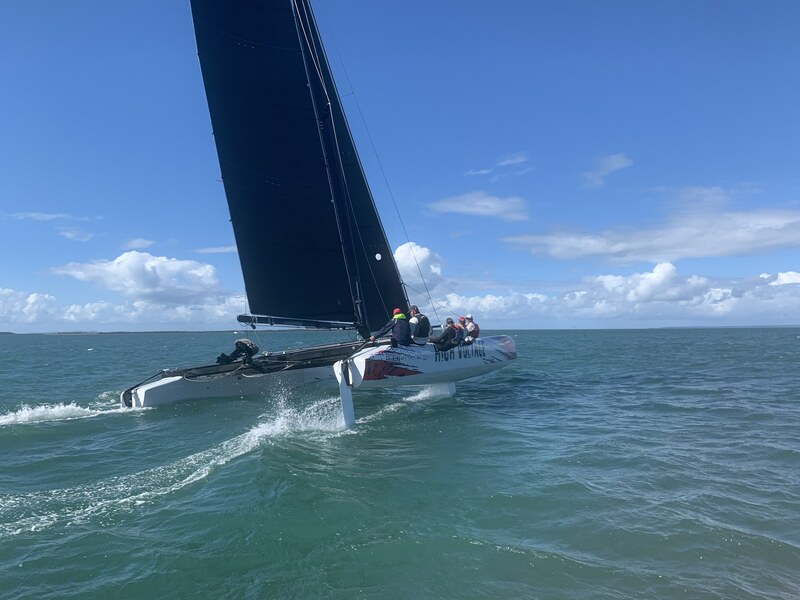 “We are hoping to grow the multihull movement from here and use the Moreton Bay Regatta as a feeder event for local boats ahead of Airlie Beach and Hamilton Island. Among the crew changes aboard The Boat Works this year is the addition of Liz Wardley, veteran of three editions of the Volvo Ocean Race (Amer Sports Too 2001-02, Team SCA in 2014-15, and Turn the Tide on Plastic 2017-18), a skipper in the Sydney Hobart at just 19 and cutting her teeth in the Hobie Cat 16 class, where she won numerous titles. “I worked with OC 10 years ago, so in a way, it’s nice to be back,” says Liz, who is relishing the change of pace. There are in fact two more boats available in the UK, and discussions underway to recruit more teams in Australia. The Extreme 40s have all been commissioned and prepped at The Boat Works, their new home base for servicing and storage.